When you were growing up, your parents probably told you to brush your teeth after every meal. As a child, you may not have understood why. As an adult, you are probably grateful for the early lessons in proper dental hygiene. But what about your dog and cat? Many people don't know that pets need dental care too. Dental disease in pets starts the same way as it does in people: poor oral hygiene. And poor oral hygiene leads to periodontal disease. Periodontal disease is one of the most common diseases of dogs and cats. Some estimates say that 70% - 80% of pets over the age of 2 have some form of dental disease. Without proper dental care, they can develop other diseases. Bacteria from the mouth can be released into the bloodstream causing damage to the heart, liver, and kidneys. Periodontal disease starts with a build-up of plaque in the mouth. Plaque is the sticky substance that attaches to the surface of the teeth. Minerals in your pet's saliva combine with the plaque and form the hard material known as tartar. Periodontal disease really starts when plaque and tartar spread below the gum line. Bacteria in the mouth release toxins that destroy the tissues surrounding the teeth. The gums become red and inflamed. This condition is called gingivitis. If left untreated, peridontitis sets in. Peridontitis is the loss of bone and soft tissue surrounding the teeth. Eventually, these teeth will loosen and fall out. How Do You Know If Your Pet Has Dental Disease? One of the first things you may notice is mouth odor. "Doggie breath" or "kitty breath" is not normal. Your pet's breath may not be minty fresh, but it should not be foul smelling. If your pet has unusually bad breath, it could be a sign of dental disease. It could also be a sign of some other serious medical problem. Check with your veterinarian immediately if you have concerns. Here are some other signs that could mean your pet has dental disease. If your pet has any of these signs or symptoms, see your veterinarian immediately. Can Dental Treats & Diets Prevent Dental Problems? The Veterinary Oral Health Council reviews products that make a claim to improve oral health. All products seeking the VOHC seal of approval must meet or exceed their highest standards. They must be proven to slow down the accumulation of dental plaque and/or tartar. Dental diets, dental treats, and dental toys may help reduce plaque and tartar build-up. Dental diets are complete and balanced for adult maintenance and can be used as your pet's main diet. Dental diets are available by prescription only. What makes these diets different? The kibble size is larger. This increases chewing time. 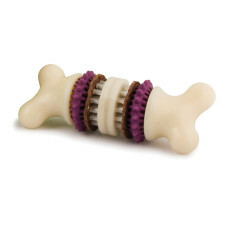 The texture is airy and allows the teeth to penetrate deeper into the kibble. By chewing this kibble, your dog or cat is "scrubbing" his teeth. Some of these diets also have a special coating that helps reduce plaque build-up. Ask your veterinarian if a dental diet is right for your pet. Dental treats use the mechanical action of chewing to clean teeth. These special treats are edible and come in a variety of sizes. Be sure that you are choosing the appropriate size for your dog. He should not be able to break it into chunks or swallow it whole. Never leave your dog unsupervised with a dental treat. Also, many of these treats are very high calorie. You don't want your dog to pack on the pounds while keeping his teeth clean! Dental toys may be a good choice for some pets. Dental toys are not edible, but the chewing action helps keep teeth clean and plaque free. They should not be hard enough to fracture teeth. This is why real bones are not a good option. Hard bones can fracture your pet's teeth. Softer bones can splinter. The pieces could get stuck in your pet's esophagus. They could puncture or create a blockage in his gastrointestinal tract. Real bones can also harbor bacteria that could make you and your pet sick. Plastic bones, cow hooves, or sterilized bones could fracture teeth. Test the treat before offering it to your dog. If you can't make a dent in the treat with your fingernail, the treat is too hard. Dental disease can be extremely painful. Anyone who has had a toothache will agree. But the good news is that it can be prevented! With proper home care, you can ensure that your pet gets high marks for oral health at his next annual exam. Now that's something to chew on!